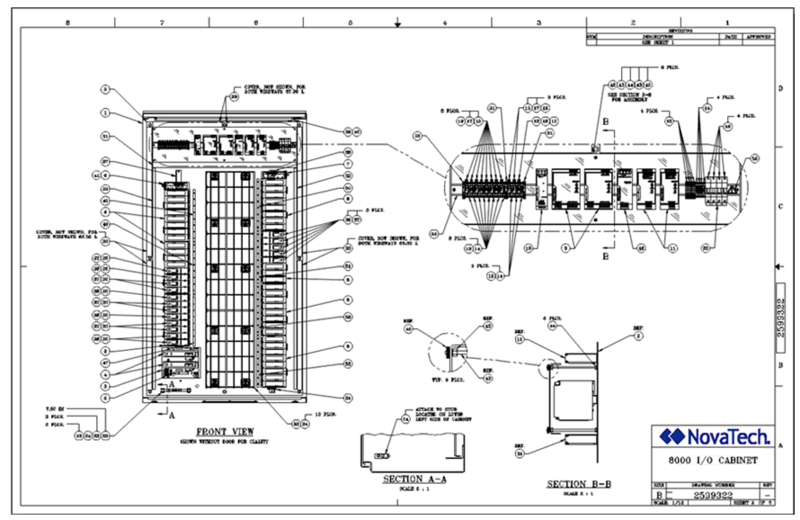 NovaTech offers custom I/O cabinet design and fabrication, power distribution grounding design and analysis, I/O network design configuration and installation, custom interface design, commissioning, and lifecycle maintenance service. Skilled NovaTech designers and electrical engineers can design, test, validate, and install custom hardware for your process control application. We offer a full suite of Hardware Engineering services from consultation on individual components to complete system design and total system lifecycle maintenance. All NovaTech cabinets have been built and tested to ensure full functionality prior to delivery, eliminating assembly, wiring and testing worries. Once it arrives at your dock and your field cables are installed, you’ll be ready to energize. When building a new network or troubleshooting or expanding an existing one, we offers a range of analysis, design, testing, and installation services that keep a facility’s digital backbone functioning at optimal levels. Our extensive experience with protocol emulation – the creation of seamless interfaces between disparate proprietary devices and networks – allows us to interface with most any standard, legacy, and proprietary network or device. Customers can thereby continue using a greater percentage of their existing hardware and network infrastructure during an upgrade. Poor power quality (surges, sags, power failures, transients, harmonic distortion, conducted radio frequency energy, chronic high or low line voltages, poor frequency regulation) and inadequate grounding (ground resistance too high, ground leads too long, ground loops between grounding systems, excessive common mode voltages, electrical noise on grounding systems) can affect your production equipment and the digital systems tied to them, leading to data corruption and computer crashes. NovaTech’s Power & Grounding Service begins with a site survey and thorough analysis of your power and grounding systems. We document our findings, design and recommend countermeasures, manage their installation and test their effectiveness.